In October 2018, the company president Kenichiro Yoshida said it was "necessary" to have "next-generation hardware" after the PlayStation 4 Pro. Sony has obviously been quiet since then, shifting everyone's attention towards its next batch of exclusive games, which includes The Last of Us Part II, Days Gone, and Dreams. 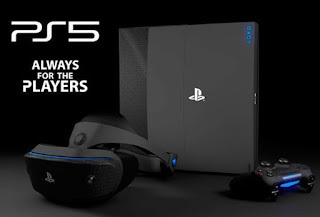 Today, however, we now have some interesting facts about the PlayStation 5; or whatever SONY decides to call its new gaming console. Furthermore, during an interview with Wired, system architect Mark Cerny confirmed that this new SONY console will be powered by a third-generation octa-core AMD Ryzen Central Processing Unit built on the company's 7nm Zen 2 micro-architecture. The new SONY device will be coupled with a custom GPU, built on AMD's Radeon Navi family, that supports ray-tracing, an advanced lighting technique currently limited to sophisticated gaming PCs, and some form of immersive 3D audio. This PS4 successor will also possess 8K graphics and, according to reports, it will ship with an SSD to accelerate rendering and reduce load times. According to Wired and engadget, Cerny illustrated this point by booting up Insomniac's Spider-Man game and showing how fast-travel times could be reduced from 15 to 0.8 seconds. Awesome, right? The architecture has been confirmed to be similar to that of the PS4. It will, therefore, be backwards-compatible with PS4 games and support the current PlayStation VR headset. Cerny stopped short of confirming a new headset or any of the services that would be available on the console. He did state, though, that it will be compatible with physical media just like the PlayStation 4 and PlayStation 4 Pro. (Microsoft, meanwhile, is reportedly working on a cheaper, disc-less version of its Xbox One S console.) Most of these details won't be a huge surprise. They're safe, logical choices for Sony which makes sense, given how successful the PS4 has been for the company. We have no idea when Sony will talk about the PlayStation 5 (or whatever it's eventually called) again, even though, Kotaku reported that the new console may not arrive until 2020. When the console finally arrives, it will encounter a new competition from the Microsoft company together with the increasing number of streaming services, including Google Stadia, that promise high quality gaming with an affordable hardware system.